Let Gods peace be the message you send today. Blossoming with a soft beauty, the DaySpring In Gods Care Bouquet offers a gift of comfort and encouragement to your special recipient. FTD has partnered with DaySpring to create this unique collection that helps you Live Your Faith in all lifes moments, great and small. 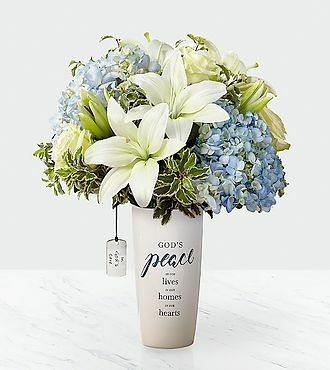 Arranged to perfection, this bouquet exhibits clusters of blue hydrangea amongst the vibrant white backdrop of cream roses and Asiatic Lilies, presented in a white ceramic vase with the sentiment, Gods peace in our lives, in our homes, in our hearts, in an attractive blue font on the front. Arriving with a special keepsake DaySpring charm dangling from the side, which reads: In Gods Care, this is a gift they will never forget.